Maxi Bond Round is a aluminum Parasol with 8 ribs which can be produced to protect you from the Sun in the Garden, Cafes, Restaurants near Pool Edges. Anodized or white powder paint coated. 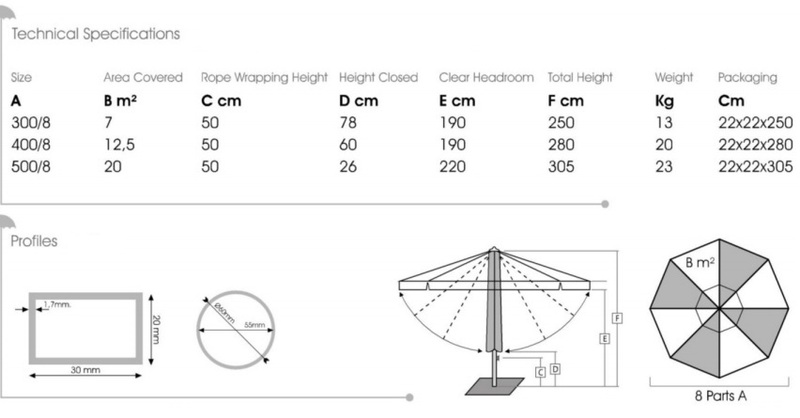 The centre Pole is 60 diameter. Pull down with rope to open your parasol after when it completely opened then you have to fasten a rope to the safety plasic part on the frame. The wind can be evacuated by air window in the top of your parasol and it has dual roof. You can use safety your parasol windly weather. 250 gr Olefin (5 year warranty) and 200 gr acyrlic waterproof polyester and 300 gr acyrlic fabric protect you from the sun for years.